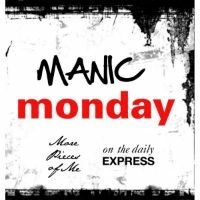 Welcome to another Manic Monday! I, for one, am ecstatic that I do not have to travel anywhere this week. I literally have been on at least 2 airplanes every week since the first week of April. I'm so over traveling, it's not even funny! I'm ready for a normal work week, but of course, this week we have two days of all-department meetings. So while I can't quite catch up, at least I'll be sleeping in my own bed all week! I adore this outfit. I just do. I feel all sorts of retro and girly in this. Lace, brocade, suede - so many textures in this outfit - it may actually be more appropriate for fall than for spring, but I'm not really caring at this point! What I love most about this outfit is the back view. The back buttons on the top, the ribbon grosgrain detail on the shoes! I just can't help but smile when I look down on my feet. I definitely need that extra pep to get me through this Manic Monday! PS Yay for not only breaking our record last week, but for also breaking the big 100! We appreciate your support and participation more than you know!! Linking up for Monday Bloom, Monday Must Haves, Mix it Monday, Personal Style Monday, and #HowISummer. This is such a pretty look! Love those retro Valentino sunnies! You look stunning love! Thanks, Erica! I just LOVE these sunnies. Obsessed with them right now! Carylee, this is my new favorite outfit of yours! I love it!!! OMG, I almost added my own link when I got to the bottom of your post here. It must be Monday! LOL! And I do not see FALL when I look at your outfit. The colors are very spring. Love the romantic hair to go with the overall look too! Those SJP shoes are SO CUTE. Glad you don't see fall! I know the colors are very spring, but I guess I just felt a little Christmas ornamenty with the metallic. Not that that's a bad thing! I loved this outfit, and actually got quite a few random compliments about it at work today. One of my favorites for sure! Really loving that skirt!!!! I agree with Gina, it looks like a bloom of spring not fall! LOL you are so adorable though in anything you wear! Well thanks so much for that! And ok - yay, glad you guys approve. I just automatically associate metallics with the holidays for some reason! very lovely look, I love the skirt!!! The shoes just naturally paired with the skirt! Lovely! Such a delicate look I'm loving those sunnies. Delicate is a good word for this! I love it - it makes me happy! Your top is so pretty and feminine. I love the color of your sandals. They bring out the mint of your skirt. Love this look on you! Thank you, Cynthia!! This outfit made me feel extra girly and great!! So loving your skirt and those adorbs heels! Thanks, girl! These heels make me so happy! I even walked around the mall in them - proves their comfort factor! I think it is safe to say we adore you in this outfit as well! So darn cute! :) Thanks so much! I needed this boost today! Those retro sunnies are awesome! Aren't they? I am in love! They're so different from anything I own. So happy with them! That skirt is all sorts of lovely.....yes to its retro vibe & the color is so versatile! I can't wait to style it different ways! It's a really great piece. what a beautiful brocade skirt! Haha - yes, shoes are great when they can make you smile! That's how they should all be! I loved all the details of this - glad you enjoyed them just as much! I love traveling but 2 flights a week sounds a lot! Can imagine how happy you are finally to have some rest! 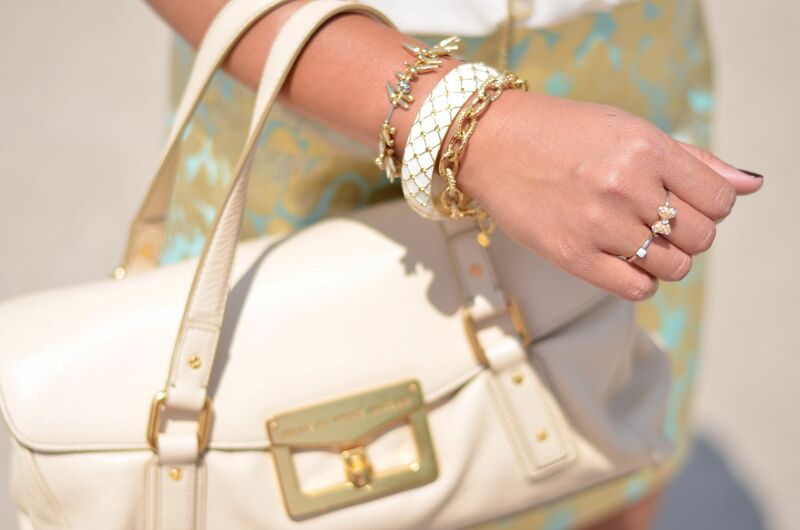 Love this look, so fresh and polished, you paired all the pieces perfectly!!! Glad you can relate! It was definitely making me ragey having to travel so much! Haha - not good for anyone!! Thanks so much for the sweet note! That skirt and your new shoes are gorgeous. 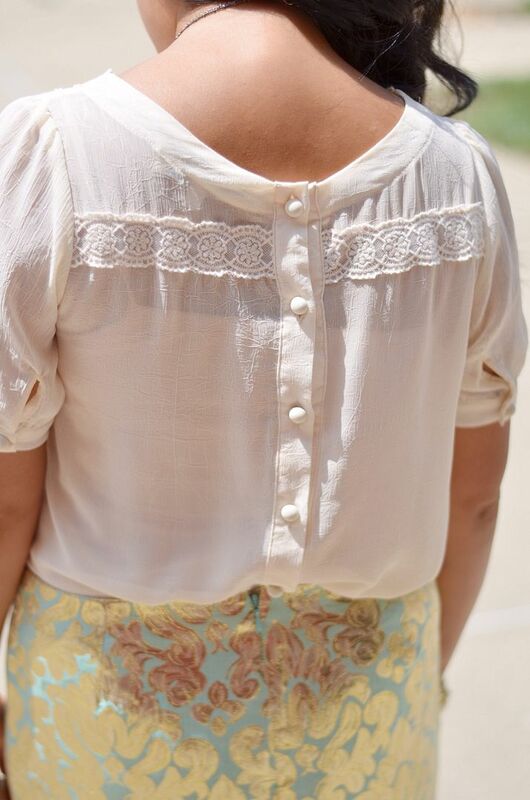 I also love the girly, slightly-bohemian Blouse. Please when you can, let me know about the sizes of the swim-suit and bandeau you recently purchased. Thanks a bunch!! Hey Ada- sorry for the delay, I was waiting to reply until I got the bikini- it hasn't arrived yet, but hopefully any day now! The bandeau-- it's true to size. I'm normally a 34 bra size and ordered a small. It fits great! Will report on the bikini when it arrives! Thanks for the nice comment! I'm just really in love with this outfit! Got the bikini! It's great and I love it! I am oddly bigger in my hips- 36" so I ordered a medium in the bottoms and a small up top. Fits perfect. I am very happy!! Loving the jacquard skirt and the details on your pumps!! I love Mary Jane pumps and have been itching to get me some..you have just added to that itch..hahah.. :) Thanks for hosting the link up hun..
Hahah - you're welcome!! I hope you find your perfect pair! And our pleasure! Happy to have you linkup! I love the mixture of textures in this look. Beautiful! Thanks so much! I loved it, too. Love when things fall together so easily like this. I sooooo love the shoes with that skirt!!! Thanks so much! I was giddy when I realized they paired perfect together! I am in love with this entire outfit! You blouse and skirt are just GORGEOUS! So sweet, Lauren - thank you so much!! Your skirt and shoes are so pretty! Lovely outfit. Thanks, Tatiana! They were a great pairing for each other! And I bought them completely separate from each other! That's the best! Those green shoes are such an unexpected touch and looks amazing! Thanks, Adri! I had my clothes laying out and these happened to be next to each other and I had an a-ha moment when I realized they'd be great together! Thanks so much! I love it a lot! You know me, I love this retro inspired outfit!! So fun and classic, you look amazing...and those SJP shoes, OMG I must have!!! Love it all! Thanks so much for hosting the link up! I was bummed they didn't have the SJP shoes in any of my Nordies, so I took my chance to order these and I'm just in love! You need them, too, promise! Aww man, that's such a big compliment from the retro queen herself! Thank you so much - this makes me smiley! Thank you so so much! I love the back - I'm glad I was able to get a detailed photo of it! I know what you mean. Traveling for work can get so old after a while. This outfit is beautiful! I love those shoes! Yes, so old! Ready for normal life - both at work and on the blog! Love this outfit! Particularly the shoes and top! Idk why but I love buttons down the back. The buttons are just a great detail! I only have a couple shirts that do this, but it's a nice subtle added detail of interest! Glad you like it - thank you! This is such a feminine and pretty look and I love your hair curled like this. Those shoes are absolutely fabulous too. I love that shade of green. I've been on the hunt for an emerald pair of shoes! I almost bought another pair last year, and I'm glad I waited and landed upon these instead! They're worth the wait! Thank you for commenting as always! Thanks, Rachelle! And thank you for hosting! So fun! Glad you're getting a travel break! I love this look! The heels and sunglasses go so perfectly with that skirt. I am loving the retro sunglasses that are so in right now. I was worried they wouldn't fit right, but they're quite comfy and I adore them! They're different for me, but variety is good! Oh my goodness Carylee, I love that green and gold colour combination on you! You look amazing! Thanks so much! I thought of you because this is a sheer-ish top, and they always make me think of you! This outfit is outstanding! It has a girly vibe but it remains ladylike and office appropriate. The brocade skirt is to die for. 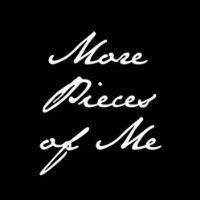 I hope you can get some "me" time this week, seems like you really need it. Living from the suitcase for weeks is no fun. Thanks for the sentiments! It will be a busy week still, but anything is better than traveling! Hopefully by Wednesday evening I can relax again! You look absolutely gorgeous! I want it all honestly, from top to bottom! Please and thank you :) The shoes are especially stunning! This is such a cute look!! Enjoy your week of not traveling and congrats on over 100 link ups!! :) Thanks so much, Darcy! And yes for sure - can't wait to not have to pack and unpack! Ahh, makes me happy. I want to travel to many different countries but after my trip this past week, I don't think that I could have a job with lots of traveling. :-) The top is pretty and very girly. I like that the buttons are in the back. Yes, travel is really not that luxurious! It gets old and tiring very very fast! And thank you! I appreciate that and glad you love the buttons, too! It just makes the look a little more special! I love this whole outfit - especially all the little details! So pretty! Thank you, Kylie! I enjoyed putting this together! I also adore this outfit! Bravo! Thanks, lady! It was the only day this week actually warm enough to wear it, so I lucked out! You always have the cutest skirts, Carylee and this one is gorgeous! Love this print mix- this is a super chic late spring + summer outfit, babe! You make me smile girl, thank you! Well thank you! I feel like my travel outfits aren't as fun as my "real" ones, but glad you enjoy them regardless!! Finally catching up with my blogs from yesterday, and it makes me totally jealous that you bought that skirt, I saw the shorts at the store, but they didn't have my size, and they were sold out online; I'll just enjoy knowing how pretty it looks on you. Aww - well maybe there is still hope and shopping fate will step in! But thank you so much! The skirt is such a great piece - I do love it a lot. You look lovely! Great shoes and bag...XO! Thanks for hosting. It's our pleasure - thanks for stopping over every week!